The Palm Treo 700p is a further refinement of what made the Treo 650 a productive and intuitive smartphone. It features a slightly refined hardware design and a large number of software, multimedia and usability improvements. The 700p is also the first Palm OS based smartphone to take advantage of high speed EVDO wireless networks. At first glance, the Treo 700p is almost identical to its Windows Mobile counterpart, the Treo 700w. The main difference is a higher density 320 x 320 pixel display and a few distinctive buttons. The 700p hardware features softer, more curved corners, squarer keys arranged in a smile pattern and improved keyboard and button backlighting. 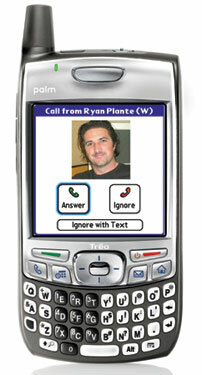 The Treo now has true dedicated send and end call buttons. The top rectangular green and red keys are now primarily used for initiating and ending phone calls. The red end key also turns the screen off and locks the device. The home key is now located in the row of application on the far right. The menu key had been moved to the bottom right of the keyboard. The center 5-way navigator is also a bit larger and is a bit easier to thumb around with. The other application buttons are user changeable and by default take you to the Phone app, calendar and email. Size wise, the Treo 700p has dimensions of 5.08" x 2.28" x 0.89" inches (129 x 58 x 22.5 mm) and weighs in at 6.4 ounces (180 g). It pretty much shares the same dimensions and weight as the Treo 650 and 700w. Inside, the Treo 700p is powered by a 312 MHz Intel XScale processor. The device has been given a boost in the memory department. It includes a 128 MB non-volitile (NVFS) chip for program memory of which 60 MB is user-available for program storage. Both the dbcache and dbheap (internal application memory space) have been increased. The dbheap is now up to 10 MB and the dbcache has a 18 MB capacity. The 700p includes a 1.3 megapixel digital camera built into the rear of the device. It can take photos at a max resolution of 1280 x 1024 and has 2x digital zoom. It can also record video clips with audio at a 352 x 288 resolution. It has automatic light balance and an improved FPS capture rate for video clips. A non-camera version will also be made available. The Treo 700p has a SD memory expansion slot. Palm has added built in FAT32 support for SD cards up to 2 GB in size. Palm engineers are currently testing 4 GB size cards for compatibility, some 4 GB cards may work others may be incompatible at this time. While the SD slot does support SDIO accessories, Wi-Fi via a SD card is still not supported. This appears to be a limitation of Garnet, though one can hope for an unsupported, unofficial work-around someday. Palm claims you won't have a need for Wi-Fi if you have an always on EVDO data plan. So we are likely stuck with Wi-Fi expansion sleds for the time being. The 700p also has Bluetooth v1.2. This allows for wireless accessories such as GPS navigation kits and wireless Bluetooth headsets. The v1.2 spec allows for faster device connections and adds the ability to use more that one Bluetooth device at once. For instance, you could keep a headset connected at the same time you have your Bluetooth GPS running. 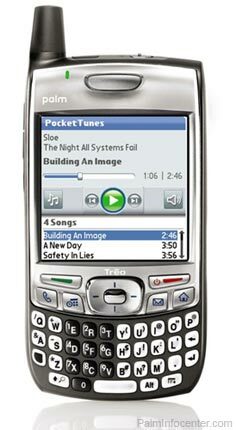 The Treo 700p runs the Palm OS Garnet operating system v5.4.9. While this is still the same Palm OS Garnet core, there have been a number of improvements to the Palm Treo platform that extend the functionality and multimedia capabilities of this device. Palm has made a number of improvements to the overall device software including substantial tweaks to Garnet's tried and true interface. I will briefly address additional device improvements in subsequent areas of this preview and definitely in greater detail within the final 700P review. First off, there is a new UI for many of the built in applications. Instead of the classic Palm OS title bar, some applications include a full width blue title bar, that looks like something more out of the Mac OS Aqua theme. A few icons have been updated including the shortcut command, which appears in the application menus. Instead of the classic command stroke, the shortcut icon has been updated with the more appropriate menu key icon. Many of the built-in applications have been updated. The photo viewer has been improved and now displays large photos and thumbnails much quicker. There is finally a voice recorder built in as well. Documents to Go v8 is now built into the device rom and includes native Microsoft Office (Word, Excel and Powerpoint) file support and PDF Files. The 700p has an impressive set of new multimedia capabilities for a Palm device. Both video and audio streaming over the Internet is now built in. Thanks to the high-speed EVDO connection and software powered by Kinoma you can now stream Windows Media player type Video and audio to the device with no additioinal third party software. For instance you can now navigate to npr.com in the Blazer browser and click on the live audio link and it will take you to the media player and start streaming NPR's live radio feed. You could also visit a movie preview website such as netflix.com and watch the streaming movie trailers on your Treo. Pocket Tunes is included on the device for MP3 digital audio and music playback. It features a new skin that resembles the new Treo UI and is a big improvement over the old RealPlayer. Owners will have an option to upgrade to Pocket Tunes Deluxe for WMA/PlaysForSure support to subscribe to DRM digital music stores such as Yahoo and Napster. Blazer v4.5 is included for browsing the web. Blazer has been enhanced with new caching rules that make browsing both mobile device optimized and full size websites a more pleasant experience. Instead of having to refresh and reload the entire page each time you exit the browser or use the back and forward buttons, the page is reloaded from the device cache. This enables much faster navigation and rendering when browsing the web or jumping from the browser to another application and back. For email VersaMail v3.5 is included. It features the usual POP3 and IMAP email support including built in settings for Yahoo Mail, AOL and Gmail. There have also been some improvements to addressing by way of remembering recent e-mail addresses. New sorting options and improved page scrolling are also present. It also includes the ability to sync with a Microsoft Exchange 2003 server, for email, calendar and contact sync. AutoSync can also be scheduled for any combination of email, calendar and contacts. The phone of the 700p uses a CDMA radio (850/1900). Being a CDMA device, the Treo 700p can access high speed EVDO wireless data networks and can fall back on 1xRTT connection when no EVDO is present. Current EVDO speed average around 300-600 kbps, depending on your signal and location. Palm is not saying at this time if a possible GSM/UTMS version of the 700p will be made. You can use the Treo 700p as a wireless modem for your laptop or desktop computer. Palm now includes an easy to setup DUN (dial up networking) connection that can be used over Bluetooth or with the USB cable. The included USB cable will now also trickle charge the device so you don't have to worry about draining the battery when using it in DUN mode. Not all carriers may support this feature, and some might even require you to purchase a additional DUN data plan. There are also some new features on the Phone side of things. Palm has brought the popular "Ignore via text message" feature to the 700p. When you dial or receive a call from an unknown number the phone will ask you if you want to add it to a new contact or add it to an existing one. The ringer switch is now a little more flush with the top of the device and will vibrate when you switch the phone into silent mode. Other niceties include the ability to add birthdays and anniversaries to contacts that will display in the calendar. The screen display will now dim, instead of turning off completely during a call (Palm says this does not impact battery life). You can assign people and ring-tones to groups of callers (family, work, friends etc...). Also, business customers may appreciate a new dialing preset feature that allows you to set the default phone extensions for use with corporate directories. Pricing and availability for the Palm Treo 700p smartphone will be announced later by Sprint and Verizon Wireless. More info at Palm.com. Stay tuned for more on the Palm Treo 700p in the upcoming the full review on PalmInfocenter. 3G is a must in Europe where CDMA is almost absent and uses other frecvency. I would realy buy one of those! - FAT32 SD card support? - does the new Blazer v4.5 support frames? I would if it had WiFi, too. I guess I don't understand why PPCs can have cellular and WiFi, but Palms don't. grrr. My guess is Palm is holding out on us. After all, if they release an ultimate device now, subsequent models will pale in comparison. A more "legit" guess would be Palm has their hands full making sure the 700p works as bug free, stable, and well as possible that they didn't have the time to entertain wifi. UMTS Baby! It must be coming, how come no rumors? Will we have to wait until "Hollywood"? A surprisingly strong device, based on Ryan's words so far! Am I perhaps the only person who'd personally rather see Palm keep hacking away at FrankenGarnet to get its speed & stability up to par? I mean, give me a carefully massaged & tweaked 700P anyday over a buggy "revolutionary" memory architecture like the LifeDrive's! This is the first Treo I've ever even given a second thought to actually purchasing & using as my daily device. I wonder what the memory structure looks like. According to the article, space required by Dbcache and DHeap is 28M. In case of a 64M chip that leaves about 32M for OS caching, which would be a bit of a waste, besides hurting battery life. If 60M are available to the user, I wonder what the other 60 are for. If it's the OS then it's the T5 architecture, otherwise it may be used for other purposes. The TX has it, and has faster booting times. My theory is that the OS in in the Nor Flash, and runs in place (nothing gets cached in ram). Other applications are in the NVFS, which may have the same total space (both available and not) as the TX. The other possibility is that everything runs off the Nand Flash (both OS and applications) but current limitations of Garnet makes this less likely. It will up the reviewers to clear up the fog. One other interesting point to notice, is the interaction in architecture evolution between the handheld and the treo lines. Innovations and corrections get carried from one the other, which should leave some hope that the handhelds will not disappear. Maybe we'll get a TX2 with larger memory caches in the fall. I'd assume it's 32 MB RAM / 128 MB flash, the same as the 700w. Adama is correct. I was also told that the OS itself sits on a 64 MB rom chip and there is no longer a need to decompress the ROM at boot, so this should have a faster reset time like the TX. Uhmm, they put the OS on a chip by itself. I wonder what that will mean in terms of performance all around. I tend to believe that it will all out fly, but that is just me. Holy freaking CRAP! That thing is gonna blow the Treo 700w away. "The dbheap is now up to 10 MB and the dbcache has a 18 MB capacity." Stability will be amazing with this. Now only if there was an HVGA screen, then I'd buy it in a heartbeat but I am still very impressed with Palm on this one. Hope U R rite. HVGA and I buy. Hang oooooon T|3! ok, how about a review!!! can I receive a call while I am on the data network? can I use more than one BT device at at time? I guess one program crashing takes down the whole thing, this is just what should follow a half baked 600 650 and vz700, what do you people (palm design team) do with you time? I really dont get it, why would i buy this? More heap, it will be much more stable in theory. From the overall quality, I'm sure Palm did a great job and from what Ryan described. the data on the call problem is an issue with all 1xRTT devices. Since the 700p uses EVDO first, you will not have that problem. Bluetooth v1.2 does allow you to use more than one Bluetooth device at a time. Like Lego said, with the RAM increase and other tweaks, this should be a more stable device. I have yet to get my review unit so I can't test that out. More details will be forthcoming in the full review. Any idea-even a ballpark one-when they will be actually available for sale from Sprint & Verizon? Same pricing as the 700W currently on Verizon ($500 w/ 2-year contract)? Early to mid June retail availability would be my guess. I'll also wager it'll be ~$50 cheaper than the "W" variant due to no M$ licensing fees and the carriers generally "positioning" the Microsoft OS offering as the premium product. So the 700P has in its favor ( as far as clear cut technical advantages) a higher-res screen, standard DUN and voice recording. It loses out on not having screen rotation & voice command functionality (no biggie). Add in the intangibles of the Palm OS and you're looking at quite a strong device. However, I am worried that they ho-hum formfactor and "old" Garnet will keep this thing from being anywhere near the runaway success the 650 was. Sprint and Verizon will be announcing official availability and pricing at a later date. I would guess based on previous leaks that it will be in stores at the End of May - Early June timeframe. OK, guys, let's not get too carried away with all this. I suggest we see what this is really like; when people can actually get the mits on these things. Who knows what new bugs may be waiting for us? I'm aghast. How could this be? No Wi-Fi (I hope for GSM, they'll offer it) and only 60MB? No, they have to pay to license it, the same as Palm OS. Not true. EV-DO does not support simultaneous voice and data calls. However, new new EV-DO devices (including the Palm 700p and 700w) will resume data sessions where they left off when a voice call comes in. Surfing the web or downloading email while talking to somebody on the phone is not possible on any EV-DO devices yet. Only HSDPA or EDGE devices on a GSM network will do that. Qualcomm has said that they are working on another revision for EV-DO in the future that will enable this, but rev B will not have it. (EV-DO rev B will boot maximum data speeds to 3.6 Mbps, similar to HSDPA's 2nd version) So we will have to wait until a possible rev C. Considering that no rev B devices have even been announced yet, rev C is a long way away. If you have to have simultaneous voice and data, you will have to go with a GSM carrier or wait a long time. Apparently the delay of EV-DO rev A has enabled them to do more testing and add in some new features that were to be on later releases. It's not perfect, since VoIP is not always an option. However, it will at least offer us CDMA people an option to be able to be online and answer a incoming call without being kicked out of what we are doing! Hopefully this is just the beginning of what Qualcomm will be able to come up with for CDMA enhancements. However, I do not think the 700p has the required A2DP profile for that to work out the box. I was under the impression that you had to switch a setting... that you had to use a different setting or pairing for call talking vs music. Can you go back and forth without setting changes? If so I'll get it and start looking for a good headset tomorrow! Then what do you get for BT v1.2, if not that? BT 1.2 adds some features to make it play nice with other applications in the 2.4 Ghz ISM band. In 1.1, it would hop all over the band without regard to other users on that band. BT wouldn't be affected by the interference, but would interfere with other users of the band (802.11b+g, wireless phones, etc.). BT 1.2 primarily makes Bluetooth a good citizen in the 2.4Ghz ISM band. Thanks, TimePilot, for the clear and simple answer!! The headset device also has to support the A2DP profile, not just the Palm. Most mono / single ear BT headsets do not support this profile. Haven't had a chance to check out the other new article on Palm's new headset. Does it support the A2DP profile? Now that 700P is 'out' what about rumored Treo 650 ROM update? Remember the "lowtide" update for the Treo 650 that was rumored a few weeks ago? FAT32 SD driver, wi-fi SDIO driver, PTunes instead of Real, further NVFS optimizations and MobiTV on Cingular were some of the most notable improvements claimed over on TreoCentral's forums. If Palm doesn't have a POS GSM Treo in the works for later in the year then perhaps a huge ROM update for the ancient 650 is the best that will be offered for GSM POS diehards. Either way, I highly doubt we'll be seeing wi-fi drivers for ANY Treo. I also think a Treo 650 update of any sort might steal a bit of thunder from the 700P but the average biz user who strolls into a Sprint/Verizon store with $ to burn will nearly ALWAYS buy whatever the newest/latest is and, assuming they even KNOW of such things, cannot be bothered with researching firmware update status etc. If the so called "lowtide" firmware doesn't include wifi driver and PTUNE, it is highly possible. Replacing realplay with PTUNE will cost PALM tons of money, and wifi driver is a mission impossible, therefore the rumor will not turn into truth forever. But I believe some guys will finally get the treo 700p ROM out and extract some files out and put into treo 650. Just checking up on the 700p, and Engadget posted something rather negative. Namely, that the SDIO slot will not support WiFi, there's no voice dialing over BT, and there will be no official support for SD cards over 2GB. Am I the only one who finds the lack of a WiFi driver depressing? -I never, EVER expected wi-fi (SDIO or integrated) in a Treo...at least not this year or this generation. Palm + the domestic CDMA carriers = one of the GREEDIEST combinations possible. -Voice dialing is a bummer but even Palm clearly states it on their site (available on 700W but not on 700P). I guess poor ol' FrankenGarnet wasn't up to that particular task. A shame seeing as I've had that for what, ~2years on my Motorola CDMA cell phones and gotten used to it, especially when using a BT headset. -Who cares if it officially supports 4gb SD cards or not? The SD Consortium hasn't even ratified or made available the spec for cards larger than 2gb! All of the 4gb cards on the market now are decidedly "YMMV" and produced out of spec anyway. I am sure Palm will somehow address SDHC compatability when it's trickling into the marketplace later this summer. Palm's been a staunch SD support since 2000...they are not going to drop the ball on an ultra-important flagship product like the Treo 700 series.